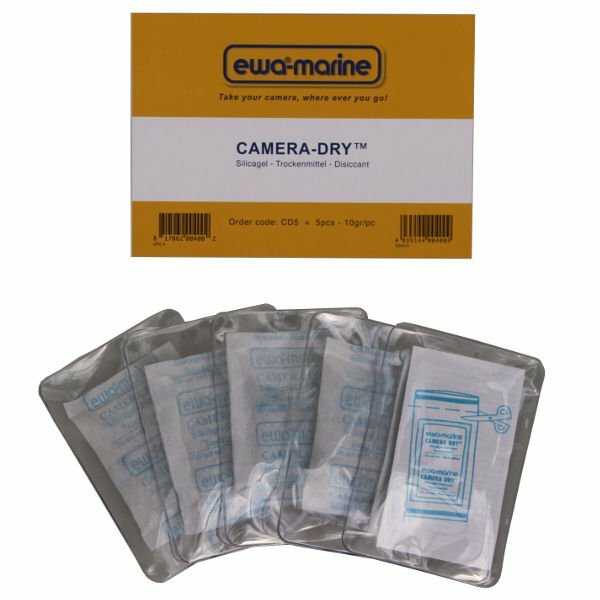 The ewa-marine "Camera-Dry" silica-gel sachets absorb moisture to prevent fogging and corrosion of your valuable electronics and cameras. Use inside an airtight storage case or container to create a perfect dry environment for your valuable items. When you insert your camera or camcorder into the housing, you are also "inserting" fresh and usually moist air. If you then enter water that is slightly cooler then the air above is, this will cause the air inside the housing to cool as well and as cool air can carry less moisture, drops of condensation can appear on the front port of the camera. This can be alleviated by adding a drying agent into the housing (ewa-marine CD-5). Many of our housings have a special pouch for the CD-5 or just insert it next to the equipment. As the silica needs some time to act, give it about 10-15 minutes after closing the housing before entering the water. Each package contains five 10g sachets containing colour indicating silica gel. The new CD5 sachet is of a blue colour. Once saturated with moisture it turns red. CD5 can then be reactivated by drying in the sun (only on a dry atmosphere) or in an oven. This process can be repeated up to five times.